Also check out the index of the book 14 pictures (5 cars) found: year of "1966", all Shelby Mustang models, exterior color of "black"
(from page 38 of the 1966 Collection) This is the inside first page of the 1966 Hertz rental-car advertisement booklet for the Black with Gold striped Mustang Shelby GT350H that you could only rent at Hertz. 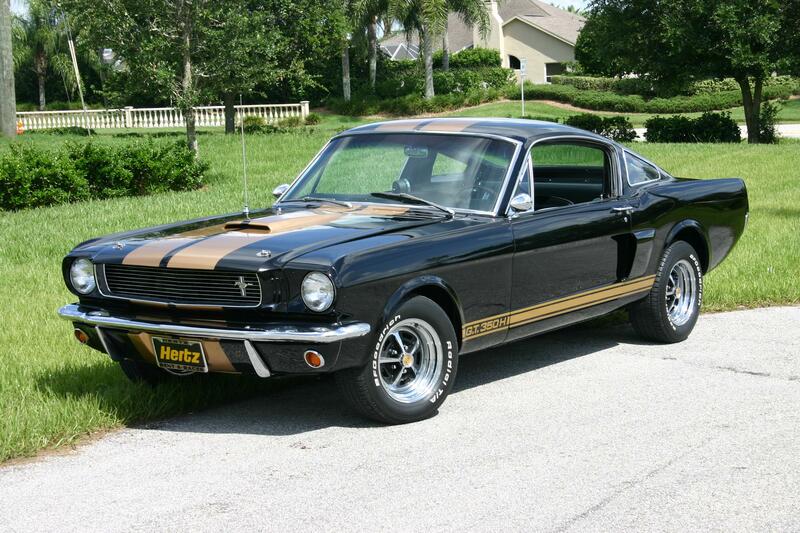 (from page 38 of the 1966 Collection) The Hertz Sports Car Club features the G.T. 350-H (The H is for Hertz) This exciting car is available for rental exclusively through Hertz in more than 60 cities coast to coast. The car is readily identifiable by its jet black body and vivid twin gold rally stripes from grille to rear bumper. These cars are available to business travelers who want a change of pace in motoring, by sports car owners away from home and by vacationers who consider driving an enjoyable holiday sport. Carrol Shelby, maker of the world-famous 1965 Manufacturer's Champion Cobra, took the Mustang Fastback and turned it into a high performance champion. First, he took the super-powered Ford 289 engine and "Cobra-ized" it... and he ended up with an unbelievable 306 charging horses. He redesigned the suspension geometry and came up with a car that handles with the ease of a street machine and the response-to-command of a competition car. There is an interesting note at the bottom that only the original renter of the car can drive it. (from page 38 of the 1966 Collection) This page of the original Hertz rental brochure of the 1966 Mustang Shelby GT350H shows some of the differences between the standard Mustang and the GT350H. (from page 38 of the 1966 Collection) The back page shows all the cities you could rent a 1966 Mustang Shelby GT350H. (from page 43 of the 1966 Collection) Close-up of the Magnum 500 wheels and G.T.350 H side stripe and graphics. The wheel center has a simple Hertz logo. I have seen others with a white or silver background with a black checkered pattern saying "Sports Car Club". See the Hertz brochure. (from page 43 of the 1966 Collection) Hertz Sports Car Club card and logo. Close-up of 1966 GT350H wheel center cap.